I know what you’re thinking! It’s dangerous, they’ll get injured, they’re past their prime… What if I talked about you like that? How would you feel? What type of mentality would that create inside of you? I believe every single person should lift weights! Male, female, young, old, tall or small doesn’t matter, lifting weights will 100% make your life better. Whether you lift in a class or on your own or with a personal trainer, if you’re lifting weights with proper form you will get stronger, have more muscle mass, denser bones, better body awareness, a stronger core and back, a better metabolism, the list goes on and on. So why would Seniors be any different? In fact I’ll take this even further, if Seniors are not lifting weights they are missing out on feeling the best they can at their age. We can reduce the chances of fatal falls, broken bones and increase their chance at living life to the fullest no matter whats the age! 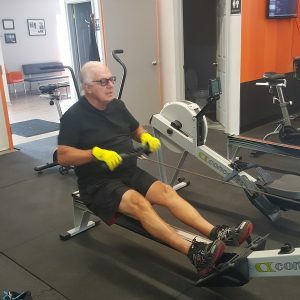 My Client Bill has been lifting weights with me for 4 years now starting from his early 70’s and now in his mid 70’s and not only have we made him more functional on a daily basis but we were able to help recover from a big rotator cuff tear and injury back to full health and beyond. Check out Bill has to say about his experience. “In this complicated world where we are constantly being marketed to for every product and service under the sun, it’s often a hope and a promise what you really get. But occasionally we are pleasantly surprised, and we get far more than expected or promised. This is the case with Radix Performance and the two principals Dan & Rachel Thiessen. Dan & Rachel don’t just own a business, they live and breathe it every day and they are able to imbue their passion onto their clients. As a result the client gets far more than expected and besides that actually has fun. I’m super passionate about this so I’ve put my money where my mouth is and I’ve started a class in our gym just for Seniors! That the main focus will be to create a better quality of life! These people have paved the way for me to live in such an amazing country with so many amazing benefits, how can I not give back to the people who have taken care of me. This class will have a big focus on Mobility, Functional Strength Training with WEIGHTS, Cardiovascular fitness and Community. I truly believe anyone you know who is in this age range will benefit tremendously from this program and live a happier and healthier life. If you’re not helping your older loved ones find somewhere to lift weights in a safe controlled environment you are doing them a LARGE injustice, just think of the years you could be adding to their lives!